It’s Friday, September 21, 2018, and the last day of summer. Tomorrow the first-year students arrive for orientation at the University of Chicago. My ducks are still around, and it’s National Pecan Cookie Day (ducks don’t like pecan cookies). Even better, it’s International Day of Peace (or “World Peace Day”). Google dedicated its Doodle on Friday to Rogers on the 51st anniversary of the first taping of his program for National Educational Television, the predecessor to Public Broadcasting Service. Like the opening of hundreds of Mister Rogers episodes, the Doodle begins with a group of young children gathered around the TV, watching as a trolley transverses a model of Mister Rogers’ neighborhood. In a claymation presentation reminiscent of another 1960s children’s show, Davey and Goliath, Mister Rogers greets friends along the way with smiles and invitations to educational adventures. On September 21, 1780, Benedict Arnold committed treason by giving the British the American plans for the fortifications at West Point, New York. Twelve years later, the French National Convention abolished the monarchy. On September 21, 1937, J. R. R. Tolkien published The Hobbit. And three Holocaust events occurred on this day in 1942, as it was the holiday of Yom Kippur: the Nazi deportation of over 1,000 Jews of Pidhatsi, Ukraine to the Bełżec extermination camp; another murder of 2,588 Jews in Dunaivtsi, Ukraine; and the Nazi order in Poland for Jews to evacuate the city of Konstantynów, moving the ghetto to the city of Biała Podlaska. On this day in 1949, just a few months before I was born, the People’s Republic of China was established. On September 21, 1981, Sandra Day O’Connor was unanimously approved by the Senate to be the first female Supreme Court justice. Finally, on this day in 1996, Congress passed the Defense of Marriage Act, defining full-benefit marriage as between a man and a woman. It was ruled unconstitutional in 2013. 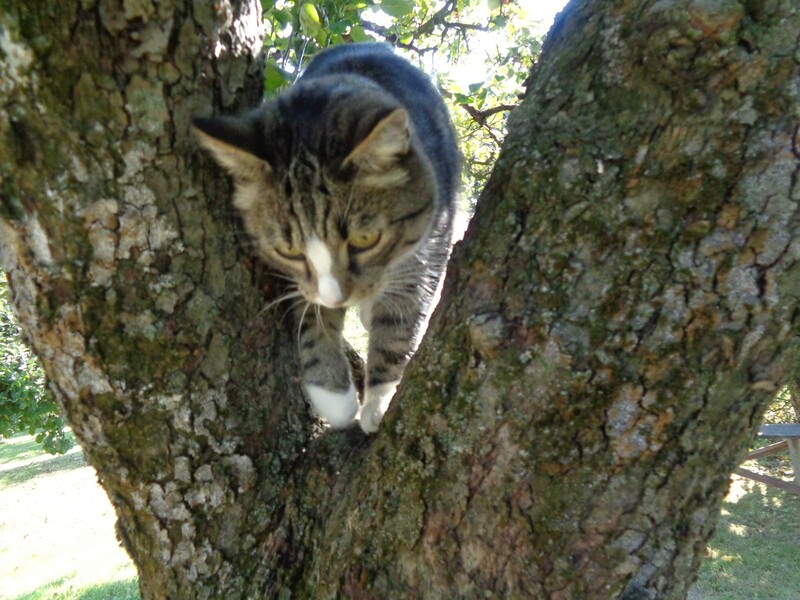 Hili: I’m returning to earth and I’m waiting for applause. Hili: For general fitness and grace. Hili: Wracam na ziemię i czekam na oklaski. Hili: Za ogólną sprawność i grację. A photo from reader Moto (it rhymes). 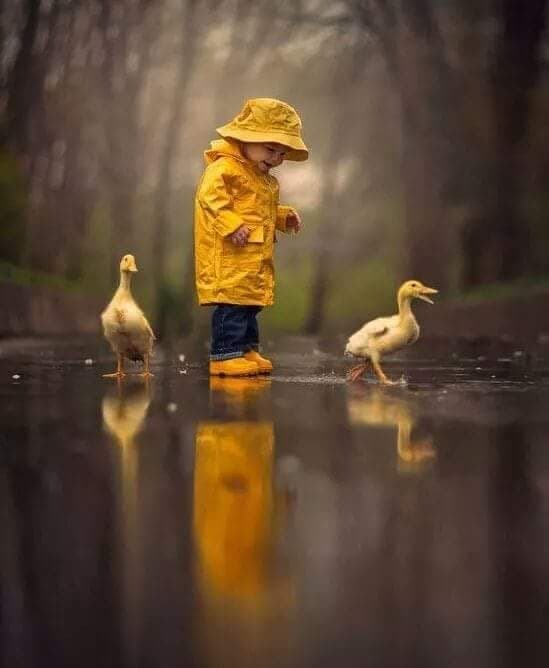 Look at those ducklings! An old Irish guy fends off burglars. Grania informs us that “Glanmire is a suburb of Cork”. Okay, this cultural appropriation thing has gone too far. British blacks aren’t allowed to play American blacks, for crying out loud! @FocusFeatures How HARD is it to cast an African AMERICAN actress for Harriet?! Like Aisha Hinds who actually is Harriet Tubman in the TV show "Underground"? This entry was written by whyevolutionistrue and posted on September 21, 2018 at 6:21 am and filed under Hili Dialogue. Bookmark the permalink. Follow any comments here with the RSS feed for this post. Both comments and trackbacks are currently closed. My theory, which is my own, is that by the time our current imbroglio is over, the name “Donald Trump” will have supplanted “Benedict Arnold” among us USians as shorthand for treachery and disloyalty. I suppose it’s not odd that most people in the U.S. know nothing or nearly nothing about Benedict Arnold. It was John Andre who paid the price and Arnold slipped away as did his wife who was complicit in the whole thing. Meanwhile Trumps problems continue to grow every day and I see Cohen is busy filling in the blanks which we will soon see. Even if Trump avoids the impeachment game he will be in deep trouble as will his happy little family. The state of New York has a date with all of these people. I do not think that all of Trump’s family is complicit. “Viruses who” instead of “viruses which”. He makes it sound as if viruses have some sort of personhood. “Mr. Rogers” was produced by WQED Pittsburgh, and Fred Rogers lived in an apartment complex next to my alma mater, Carnegie Mellon. I met and spoke with him many times as he walked the campus or used the gym. I am happy to report that his private persona was indistinguishable from his on-screen presentation.In real life he was exactly… Mr. Rogers. People debate the sexuality of Bert and Ernie for years but a guy named Mr. McFeely can deliver special “movies” to an ordained minister (Mr. Rogers) every single day and no one bats an eye. The responses to Pluckrose’s tweet are full of bile and stupidity, including one person who insists that Evil White People have conspired to keep Harriet Tubman out of the history books. Apparently they haven’t done a good job of it. Are we not celebrating this day in 1823 when Angel Moroni first visited Honest Jo Smith? More accurately, celebrating the skill of the old time shyster. I saw a good documentary earlier this year about Fred Rogers, Won’t You Be My Neighbor?. I’d forgotten what a bête noire he was for a certain segment of the rightwing. Ken – edumacate me re Mr. Rogers of whom I know nowt. Why was Mr. Rogers disliked by a segment of the right wing? Teaching uncomfortable, non-Christian approved facts or did it extend beyond evangelical loons? We never deserved Fred Rogers. Or Steve Irwin. I worked with the daughter of one of the producers of Mr Roger’s neighborhood. She grew up knowing Fred Rogers and said that the show is no act. He really was the nicest human being to have every lived. You get a chance, see the documentary; it’s really good. To complete the context, Mr. Rogers program was aimed at preschool children. Henrietta Pussycat, Old Rivers – they just don’t make ’em like that any more. 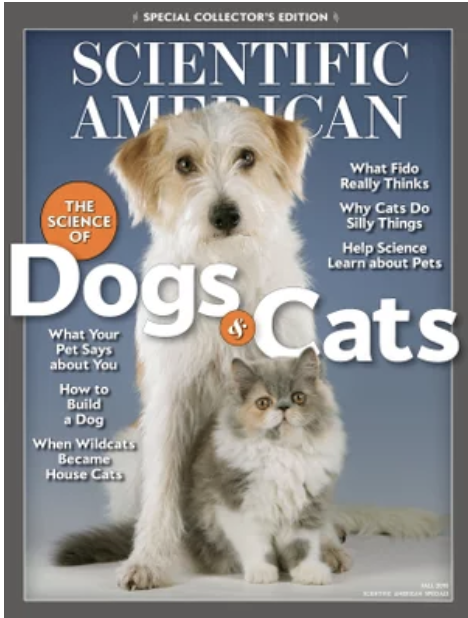 As to Scientific American – Why Cats Do Silly Things – ignorant humans. “Why Cats Do Silly Things”. Preceded by “What Fido Really Thinks”. It looks like a pro-dog, anti-cat issue. / dog thinks!? I love Moto’s foto. And the ‘pole-cat’ is hilarious. Great stuff in this post! I especially liked the ducklings (I wonder, is the middle one Moto’s?) and the evolution scheme.